Here are Matt Smith's takeaways, wildest stat lines, and resume rankings after week seven. -LSU’s defense wasn’t exposed against Florida. After seeing what the Gators did on the ground against the Tigers, the concerns about going against Georgia were many. However, Florida’s 200-yard rushing day against LSU now looks just like a beautifully-called game after Georgia was held to just 3.8 yards per carry in LSU’s rout of the previously-unbeaten Bulldogs. The Tigers were also in Jake Fromm’s face all day, holding him to a sub-50 percent day through the air. -Speaking of Fromm, Saturday’s performance in Baton Rouge was a regression to his play against Missouri and Tennessee after a sharp day a week ago against Vanderbilt. There’s probably not a better secondary in the country than LSU’s, but when Fromm had open receivers, he missed way too many of them, including a likely touchdown to Mecole Hardman early in the game. He’s a cool customer that has generally displayed a short-term memory on the field, but Fromm has to be better for Georgia to make it out of its post-bye Florida-Kentucky stretch still atop the SEC East. -Tennessee showed plenty of heart in its loss to Georgia, and Jeremy Pruitt was able to get that effort to carry over after the Vols’ bye week. Auburn has reached a 2015 level of freefall, but the Tigers are still a far more talented team than Tennessee. For the Volunteers to go into Jordan-Hare Stadium and pick them apart through the air represents another massive step forward after an ugly first four weeks for Tennessee. This might be the team’s only SEC win this season, but Pruitt has this team believing that great effort is going to eventually translate into wins now that there’s finally some hard evidence to which to point. -The wheels have fallen off Auburn, and it’s an all too common occurrence for Tigers teams that aren’t at a championship level. Once it starts slipping, it just completely unravels, and this year is no different after the Tigers’ third loss of the season that ended Tennessee’s 11-game SEC losing streak. This week’s trip to Ole Miss is now probably a must-win if the Tigers want to even make a bowl game. Remember, a month ago Monday, they were ranked No. 7. -Alabama’s defense played one of its best games of the season, but the offense bogged down in Missouri territory with a hampered Tua Tagovailoa and some minor bumps and bruises in the wide receiving corps. The Crimson Tide reached the red zone seven times, but scored touchdowns on only three of those drives. The game was more lopsided than the 39-10 final would suggest, with Alabama outgaining Missouri by more than 350 yards. It’s nitpicking, as it almost always in when criticizing Nick Saban’s team, but finishing drives was a legitimate issue on Saturday night. -Drew Lock and Barry Odom as a tandem are now 1-16 against teams that finished with or currently have a winning record (the lone win was a 17-point comeback over 7-6 Arkansas in 2016). No one was expecting Missouri to even threaten Alabama, but the larger point is the Tigers’ and Lock’s inability to rise to the level of their competition. The Tigers now face 4-3 Memphis, 5-1 Kentucky, and 6-1 Florida in the next three weeks. Missouri has to find a way to go 2-1 in that stretch. -Texas A&M’s defense just continues to get it done. The Aggies held South Carolina under 300 yards on Saturday, as the Gamecocks converted just twice on third down and completed fewer than 50 percent of their pass attempts. They also intercepted a pass and recovered a fumble. It doesn’t take much from the offense when the defense is doing that, and that’s why the Aggies are the best two-loss team in the country. If this team doesn’t get to 10 wins after bowl season, it would be a disappointment. -Auburn isn’t the only SEC team with preseason hype that may be home for the postseason. South Carolina is sitting at 3-3, and still has road trips left to Ole Miss, Florida and Clemson. The canceled Marshall game could prove very costly if the Gamecocks don’t find a way to win one of those November games away from Columbia. They were mostly dominated by Texas A&M on Saturday at home, even though the 26-23 final score may indicate a closer game. 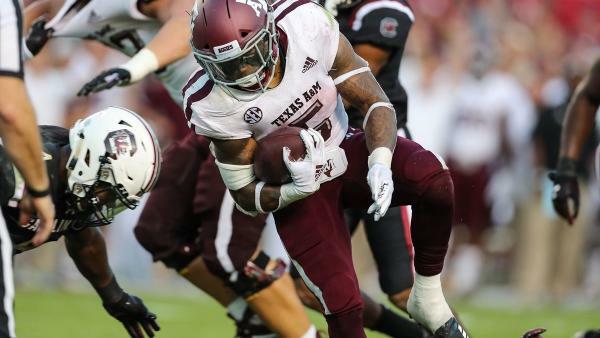 The Aggies held the ball for more than 41 minutes, physically wearing down South Carolina. Now comes a much-needed bye week. -Florida had what seemed to be a natural letdown against Vanderbilt, falling behind 21-3 before outscoring the Commodores 34-6 over the final two-and-a-half quarters. However, the offense did move the ball right away, but incredibly costly turnovers helped Vanderbilt take a three-score lead before the big rally. It certainly wasn’t a crisp performance from the Gators in a classic sandwich game, but when they got punched in the mouth (only figuratively, but it came close to literally), they played their best football of the season. For the first time since 2012, we’ll have a truly meaningful Cocktail Party in two weeks. -Ole Miss feels like a 3-4 team, but the Rebels are somehow 5-2 with losses only to two top-five teams. They were gifted a 37-33 win at Arkansas on Saturday night, but credit to Matt Luke and his team for rallying back on a miserable night in Little Rock against a team that has had a bit of a hex over them in recent seasons. Losing star wideout D.K. Metcalf for the season is jarring, but Luke should again have this team finishing .500 or better despite being banned from a bowl. He’s prevented the bottom from falling out of the program when it easily could have. -I called for four teams to show me this past Saturday if they were truly good or just mirages. Only one of those four passed the test, and Michigan did it in resounding fashion with a 38-13 mauling of Wisconsin. It was a different story for Colorado, Miami (FL), and West Virginia. The Buffs were only mildly competitive against USC, the Hurricanes stunk it up in a loss to Virginia, and the Mountaineers were soundly beaten at Iowa State. -Notre Dame’s game where it would simply have to just survive and advance was inevitable, but that it came against Pittsburgh on Saturday, even with the history of this series, was a bit of a surprise. It was Ian Book’s worst game of the season, but if he can complete 81 percent of his passes on a bad day, that bodes quite well for the Irish going forward, whose defense allowed only seven points in a 19-14 Fighting Irish win. -It looked as if both UCF and USF would fall from the unbeaten ranks, but the dream of 10-0 vs. 11-0 for the War on I-4 on Black Friday in Tampa remains alive. The Knights survived Memphis, 31-30, as the Tiger shot themselves in the foot many times over with stupid penalties and awful clock management on a potential game-winning drive. As for USF, Tulsa hadn’t beaten an FBS team all season, but the Golden Hurricane led the ranked Bulls 24-10 in the second half before USF scored the final 15 points to win. -My dream of a 7-way tie for the ACC Coastal title is still alive, but North Carolina may simply be too awful to scrape together four conference wins. The Tar Heels did beat Pittsburgh, but let a golden opportunity for a home upset against Virginia Tech slip away on Saturday night. The Hokies are now 3-0 in league play and look like the division favorite again after Miami (FL)’s loss at Virginia (the Hurricanes come to Blacksburg in late November). I’m not giving up yet though. -Congratulations to Chip Kelly and UCLA, which won their first game of the season in dominant fashion, routing Cal, 37-7, in Berkeley. The Bruins appeared to turn the corner in last week’s close loss to Washington, and the fight they showed has now translated into a victory. As for another notable first-year head coach, Scott Frost is still winless at Nebraska after the Cornhuskers fell to 0-6 in a meltdown at Northwestern. Nebraska blew a two-score lead late in the fourth quarter and lost in overtime after a bad snap on fourth down I think the losing streak ends at home next week against Minnesota, but if it doesn’t the ‘Huskers will likely have double-digit losses for the first time in program history. -Of the last 18 pass attempts thrown by Rutgers, 10 have been incomplete, six have been caught by opponents, and two have been caught by Rutgers. Rutgers hasn’t topped 17 points in any of its last six games and nine of its last 10. What a complete disaster in Piscataway.